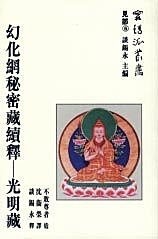 ⑴Dudjom Rinpoche, The Nyingma School of Tibetan Buddhism, Its Fundamentals and History; translated and edited by Gyurme Dorje with the collaboration of Matthew Kapstein, Boston 1991, Vol. II, pp. 262＆275. (26)參見Leonard W, J. van der Kuijp, Bagsi and Bagsi-s in Tibetan Historical, Biographical and Lexicographical Texts（在藏文歷史、傳記、字書類文獻中的八哈失），CAJ 39/2,1995，pp. 275-299. (34)關於伏藏類文獻的歷史、內客、種類及其餘教意義參見Janat B．Gyatso，"Drawn from the Tibetan Treasury: The gTer ma Literature", Tibetan Literature, Studies in Genre,Edited by Jose Ignacio Cabezon and Roger R. Jackson, Ithaca: Snow Lion, 1996, pp. 147-169. (37)德國波昂大學中亞語言文化研究所Peter Schwieger博士多年來從事對德國柏林國家圖書館所藏楚蔔寺版《伏藏寶庫》之編目、整理工作，至今已出版目錄三冊：Tibetische Handschriften and Blockdrucke, Teil 10, 11, 12, Die mTshur-phu-Ausgabe der Sammlung Rin-chen gter-mdzod chen-mo, nach dem Exemplar der Orientabteilung,Staatsbibliothek zu Berlin-Preussischer Kulturbesitz. Beschrieben von Peter Schwieger,Franz Steiner Verlag Stuttgart, 1990, 1995, 1999. (38)參見Matthew Kapstein, “Remarks on the Mani Bka’ bum and the Cult of Avalokitesvara in Tibet", in Tibetan Buddhism: Reason and Revelation. Ed. by Ronald M. Davidson and Steven D. Goodman. Albany: State University of New York Press, 1991, pp. 79-94. (39)參見Henk Blezer; Kar gling Zhi khro, A Tantric Buddhist Concept; Leiden: Research School CNWS, School of Asian, African, and Amerindian Studies, 1997, pp. 39-93. (40)據智悲上師《衛藏聖跡志》記載：「〔于雅隴〕北部山嶺上有最馳名的雅隴協吉劄浦（水晶岩洞）大修道處。修道處中心有蓮花生的真身替代像，是開口顯過聖的神像。其他天然生成的神像還狠多。協劄山的下麵不遠的地方有村吉扛康（mTshan brgyad lha khang八相神殿）、乃提拉章宮（gNas mthil bla brang中央宮）等，內中有蓮師的替身像、日光法衣，還有禪仗等內供佛寶甚多。在巧策拉喀（Phyag‘tshal la kha禮拜山口）山口有特別殊勝的棄屍場和大寶塔，離屍場不遠處有佛母意希措結（智慧勝海）的修道秘密窟。山左邊的背後有鄔堅林巴（鄔仗洲）取伏藏的地方，名白馬協浦(padma shel phug蓮花水晶洞），但距離比較遠點。」見智悲自在著，劉立千、 謝建 君譯，劉立千校，《衛藏道場聖跡志》，中國社會科學院民族研究所歷史室、西藏自治區歷史檔案館，《藏文史料譯文集》，1985，頁16。另參Alfonsa Ferrari, mlKyen Brtse’s Guide to the Holy Places of Central Tibet. Roma, IsMEO, 1958, p. n. 271-277. (46)關於西藏死書及其在西方的流布和影響見Donald S. Lopez, Jr.,《香格里拉的囚徒》(Prisoners of Shangri-La)，Chicago: The University of Chicago Press, 1998, pp. 46-87;David Germano,《死亡過程、死亡及其他時機》“Dying, Death, and Other Opportunitiesi, In Religions of Tibet in Practice, Ed. by Donald S. Lopez, Jr. Princeton: Princeton University Press, 1997, pp. 458-493.